We’re so close. SOOOOO close to a holiday weekend. That glorious fact makes me all kinds of happy. Sleeping in. Eating. Celebrating. It’s all a mere 2 days away. I know a grocery trip (or two) are in your future in preparation for your delightful Labor Day plans. Or work week lunches. Or school-packing endeavors. I don’t know about you, but I spend an incredible amount my week at grocery stores. I secretly love it, though. Perusing through all the aisles, picking out my favorite items to concoct my favorite meals, snacks, and desserts. And while I’m fond of Aldi’s and Whole Foods, I can honestly tell you that I will drive miles to be able to buy from Trader Joe’s. Not only would each and every employee do nearly anything to make your happy during your time in the store, you can’t beat their prices or their quality. Mark and I go to TJ’s at least once a week, and we always leave with bags full of goodies to enjoy throughout the week. Mark’s mom actually inspired this post. She drove nearly an hour to shop at a Trader Joe’s after reading a “What to Buy at Trader Joe’s” post, similar to this one. I always get a kick out of reading these kinds of posts, because I almost always learn something new about my beloved TJ’s. Alas, in the name of delicious flavors, I ran around my local Trader Joe’s like a maniac with an iPhone, taking pictures of all my favorite foods just for you. I even included some serving ideas that go along with each and every item. Let’s get cookin’! If I needed to survive on any one ingredient for the rest of my life, TJ’s Rolled Oats would be it! 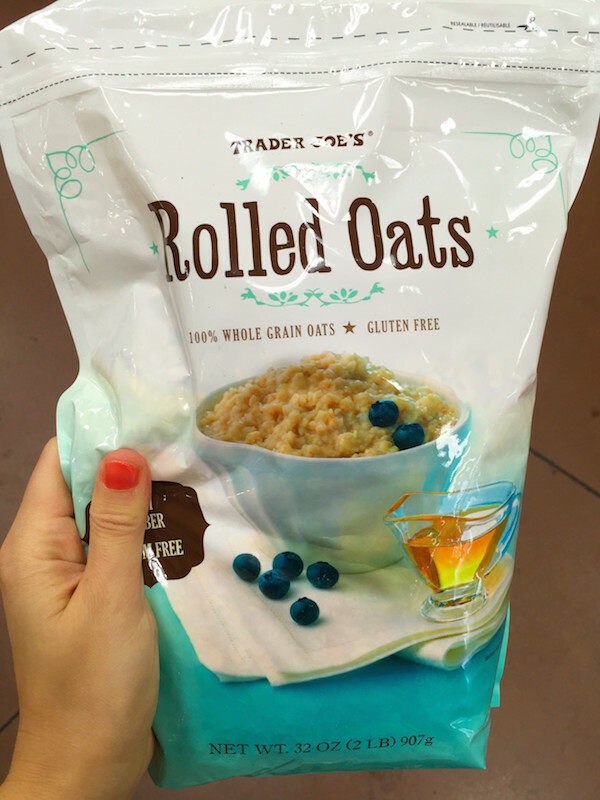 I haven’t found another brand of rolled oats that compare in texture; these oats are the perfect fuel to my oatmeal obsession. I pick up a bag nearly every time I’m at TJ’s because I’m always afraid that I’m going to run out. 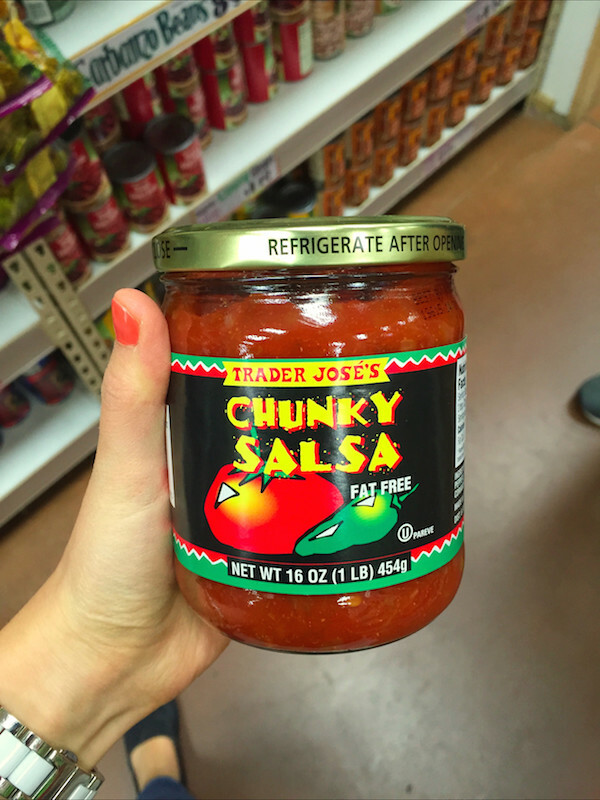 My favorite Trader Joe’s product. By far. 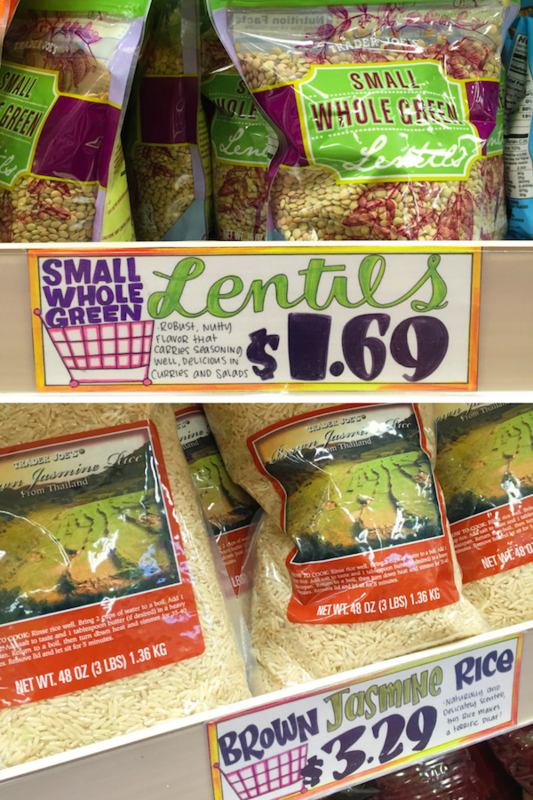 Lentils are such a wonderful source of vegetarian protein, so I always make sure to throw them in my cart (or “buggy,” as Mark calls it ;)). TJ’s Brown Jasmine Rice is so fluffy, chewy, and nutty; it’s the perfect accompaniment to our weekly Mexican and/or Thai Burrito Bowls! Seriously. 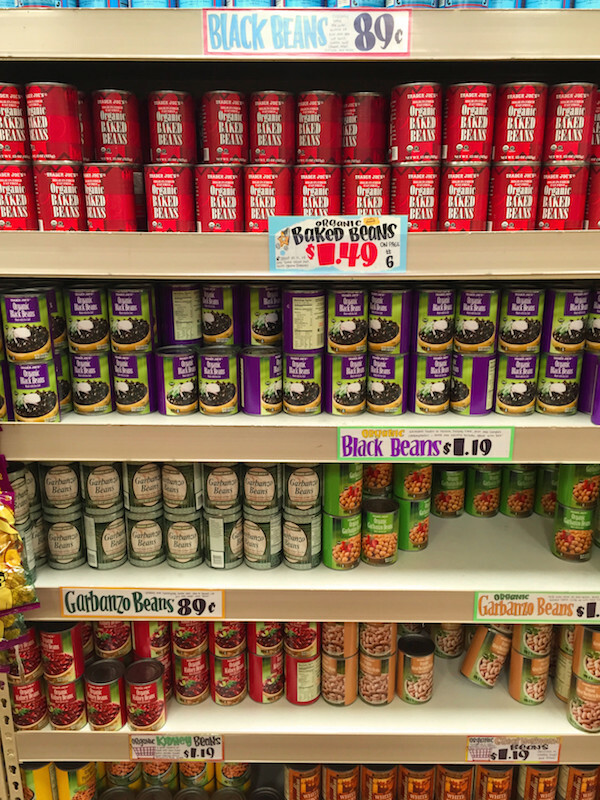 $.89/can for black beans. How do you do it, Trader Joe’s?! Mark and I go through an insane amount of beans due to our undying love of Mexican food. Canned beans are such an easy protein addition to a meal, so I try to keep some on-hand at all times. As a plus, TJ’s also has a great selection of organic beans! Beans for the win! Growing up, my favorite food was pasta. Pasta with alfredo, pasta with pesto, pasta with red sauce…I didn’t discriminate against the ultimate comfort food. After I started understanding nutrition, I noticed that the recommended serving of pasta left me hungry, so I turned away from my beloved noodles for many years. 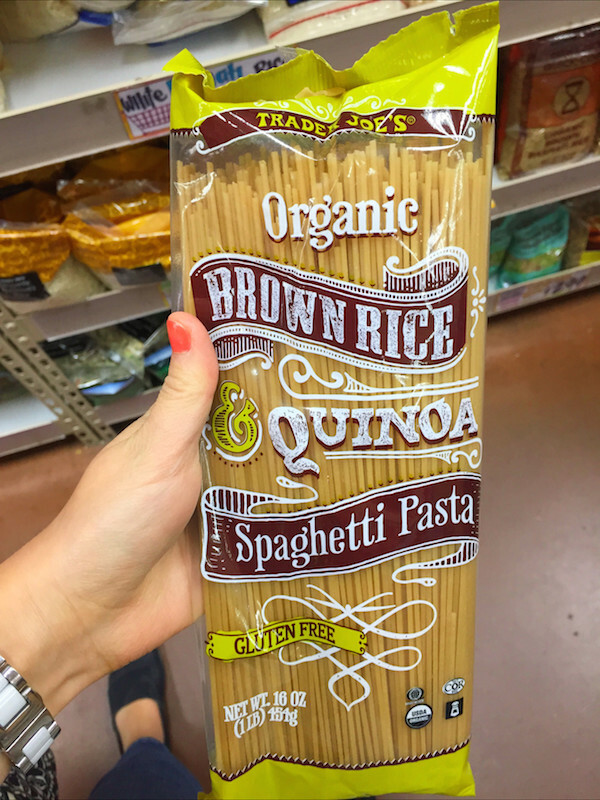 Luckily, TJ’s Organic Brown Rice and Quinoa Spaghetti Pasta came to my pasta-lovin’ rescue. It’s made from 3 naturally gluten free ingredients (brown rice, quinoa, and water), and its flavor is similar to whole wheat pasta. When you have a hankering for pasta, definitely give this stuff a try. Winter is coming. 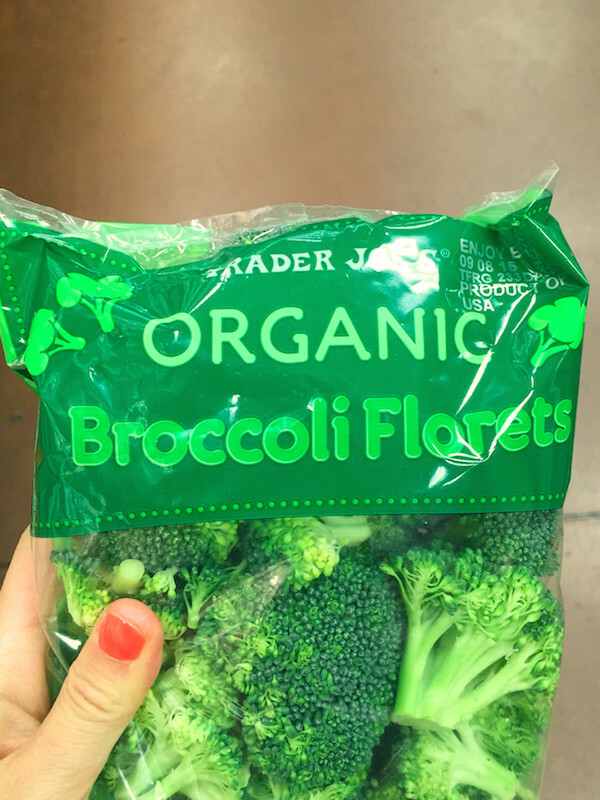 Fresh produce won’t be as easy to find, so I like to keep a couple bags of frozen vegetables stashed in my freezer. 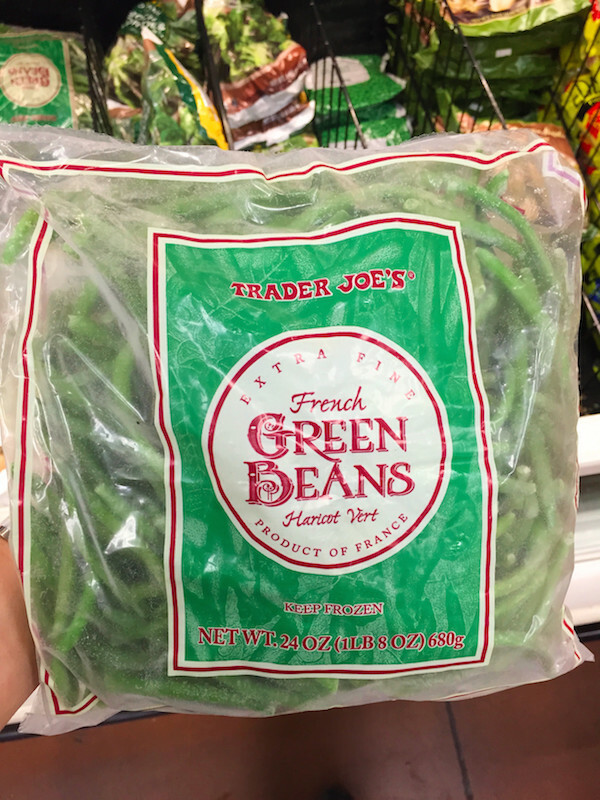 I’m obsessed with green beans, so I love keeping this giant bag of frozen French Green Beans on hand. I also can’t get enough of their frozen brussels sprouts. They’re bite-sized, making them perfect for salads or straight munchin’. 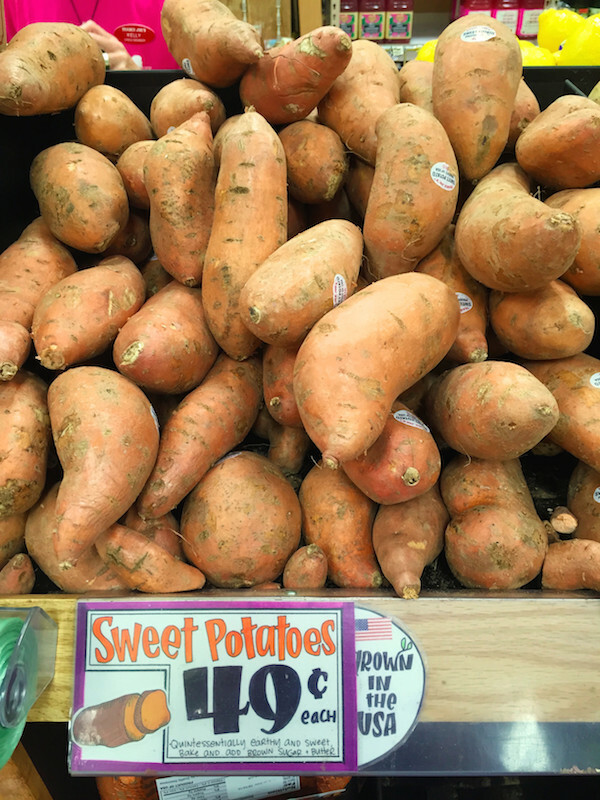 I couldn’t live without my trusty sweet potatoes! I love that TJ’s offers them for only $.49; add a spoonful (or two) of peanut butter, and you’ll have yourself my favorite quick and easy entree for under $1! Incredible. If an apple a day keeps the doctor away, I’ll never see another doctor in my life. I eat at least two of these bad boys a day, and I crave them all.the.time. Nothing compares to their sweet bite or crunchiness. 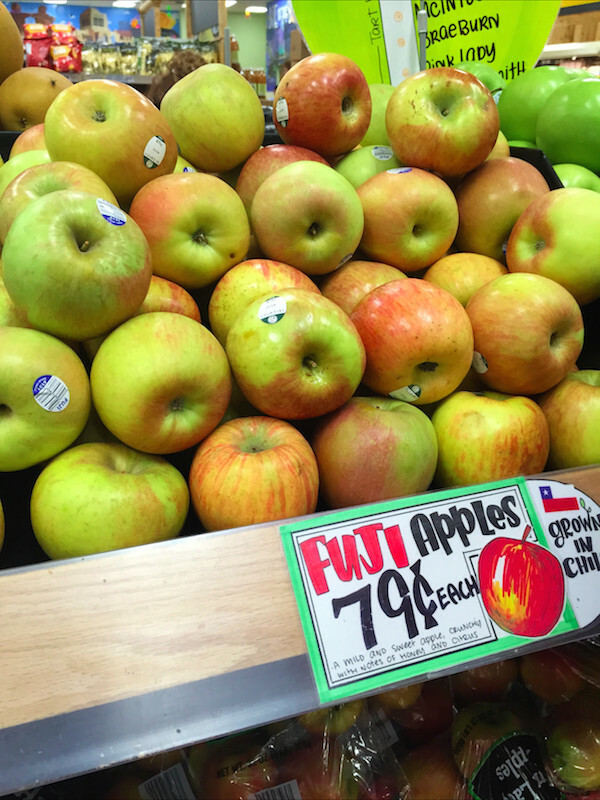 And how can you beat $.79/apple? I’m obsessed with these! It took me many years to try a whole carrot. Like most kids, I always gravitated towards those cute, little baby carrots. I swear, after I tried a whole carrot for the first time a couple of years ago, I ate an entire pound of them. In one sitting. Whole carrots have so much more flavor than baby carrots; they’re sweeter, crunchier, and way more addictive. These days, I love dipping them in my 3-ingredient Ultimate Vegan Dipping Sauce. 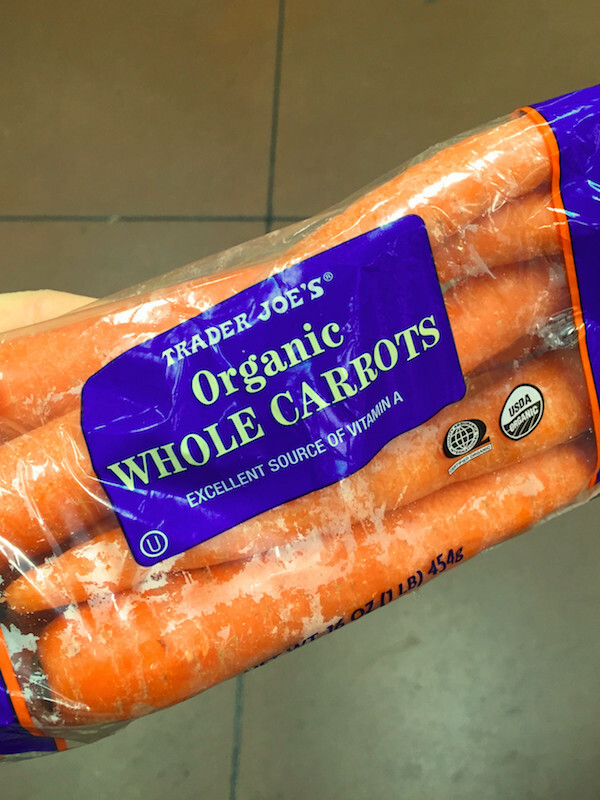 Pick up a bag of whole carrots the next time you’re at TJ’s and taste for yourself! Time for a “you know you’re dating a food blogger when…” moment. A couple of weeks ago, Mark and I were hungry for a late-night snack. After checking our fridge and pantry, we noticed that we were grotesquely low on groceries and that we had run out of our beloved popcorn go-to. Mark suggested that we roast up some broccoli and serve it with a variety of dipping sauces (including this finger-lickin’ good Thai Peanut Sauce). Best. Night. Ever. You know I’m hitting up TJ’s nut butter section nearly every time I step foot in the store! 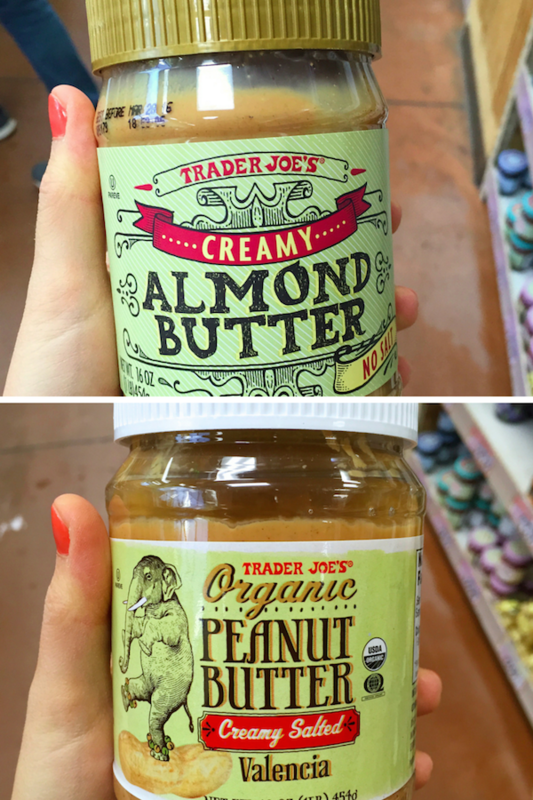 I’m obsessed with TJ’s nut butters, particularly their almond butter and their organic peanut butter. The prices are so fair. The nut butters are so perfectly creamy. Addictive, I tell ya! Don’t pass ’em up! Dried fruit is the perfect nutrient-dense snack. It’s totally sweet, chewy, and down-right addictive. That being said, when it comes to dried fruit, I sometimes have trouble peeling myself away from the bag. Luckily, TJ’s has small containers of all of the dried fruit you could possibly think of. And, they’re reasonably-priced to boot! 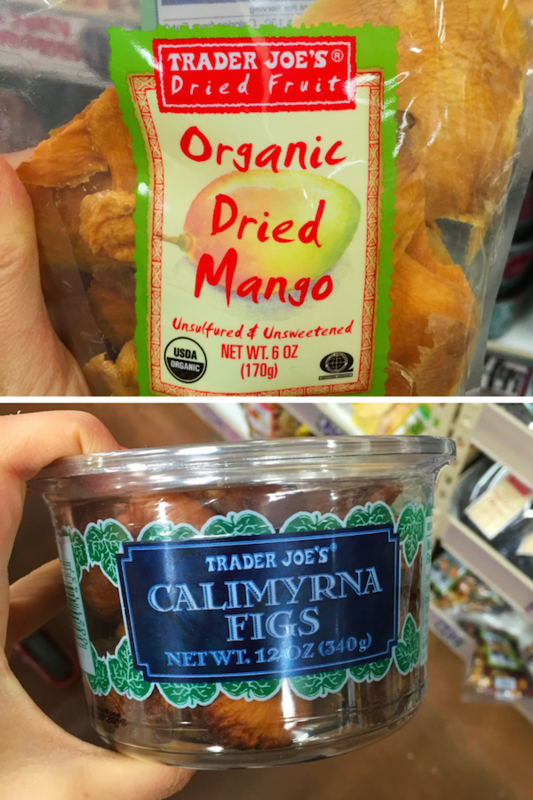 I’m a huge fan of their dried mango and dried figs, but you can’t really go wrong here. If there’s one aisle that completely does me in at TJ’s it’s the nut and seed aisle. 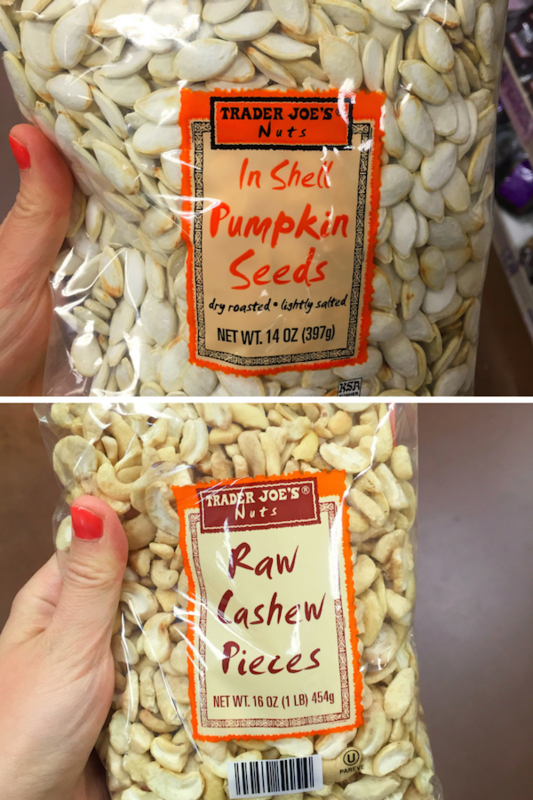 I love keeping raw nuts on hand for snacking, and I adore throwing them into some of my favorite recipes. When you’re feeling snacky and a little indulgent, look no further than this incredible crunchy goodness. As I’ve mentioned a couple times, Mark and I are obsessed with popcorn. When we’re feeling particularly lazy and don’t feel like popping it ourselves, we often reach for a bag of this stuff! It has a slight olive oil taste on it’s own, but you’re more than welcome to doctor it up just a bit. We love raiding TJ’s oil and vinegar aisle. Mark is an olive oil fiend, so we like buying TJ’s Premium Extra-Virgin variety. And I adore the cute little spout it comes with. 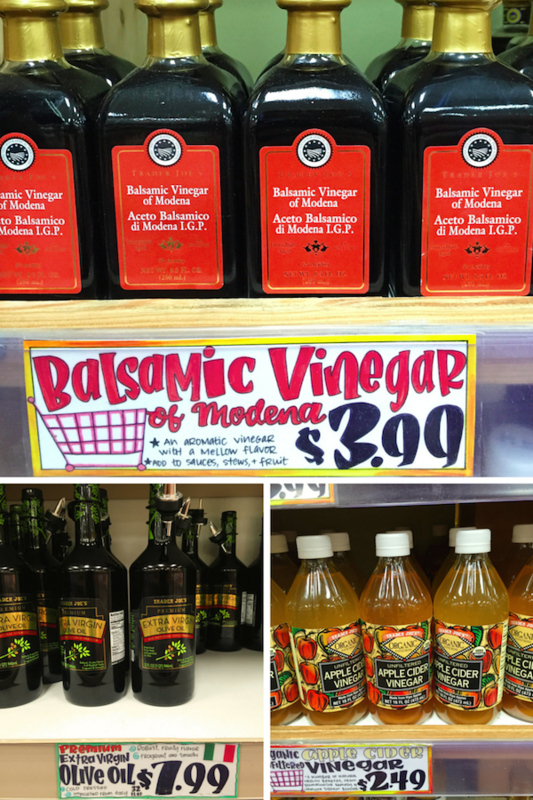 I also like keeping a reserve of balsamic and apple cider vinegar on-hand for quick and easy salad dressings! I’ve eaten an entire jar of this stuff on the couch with a spoon. Enough said. 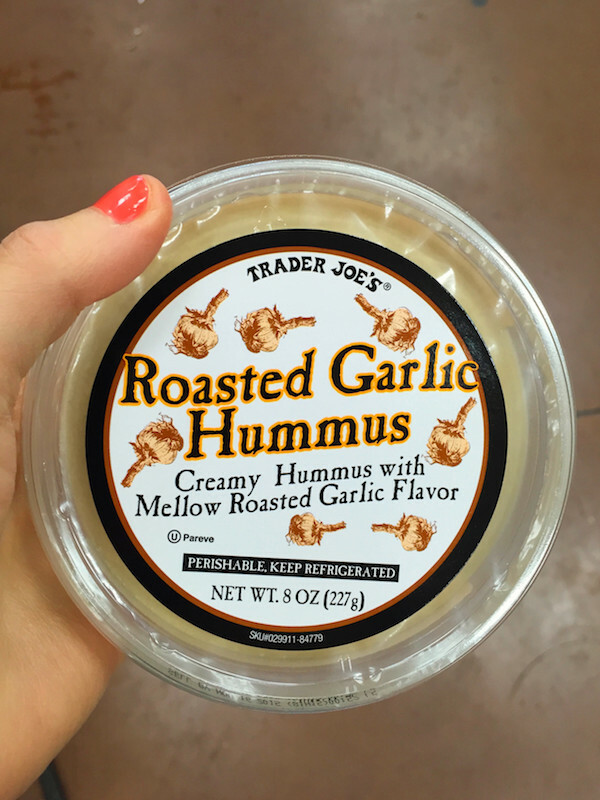 Hummus is a staple in our household, and TJ’s has an impressive variety of sizes, colors, and flavors. This Roasted Garlic variety is definitely one of my favorites, but there truly is something for everyone! I love that I can recognize each and every ingredient in most of TJ’s hummuses, so I always tend to pick up a container…or two. It’s a Thursday night. You’re tired from a long day at work. You’re hungry. How does some pasta sound? Let’s top it with this 9-ingredient marinara sauce. It’s rich, slightly chucky, and super flavorful. It’s a delicious base all on its own, but we like doctoring it up with a little bit of red pepper flakes and garlic. Delicioso! I cannot believe that TJ’s sells a bag of beautiful coconut flour for so cheap! 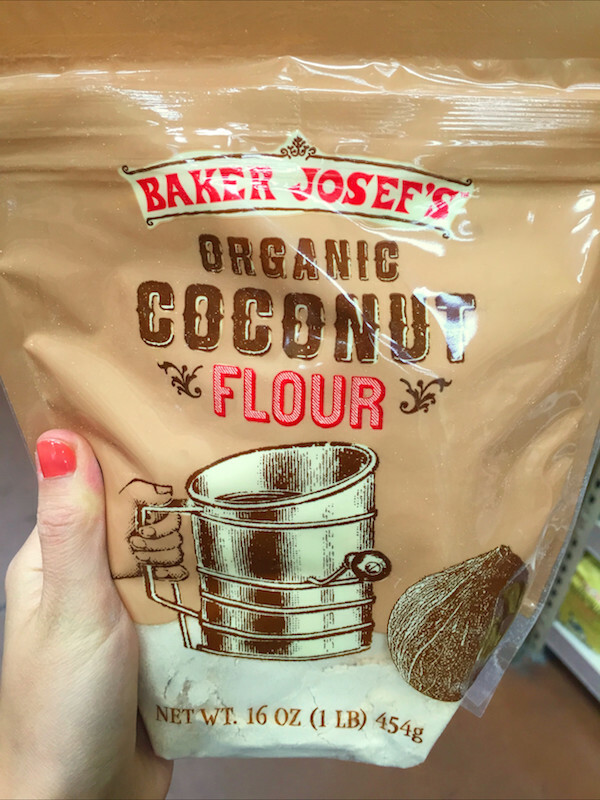 Coconut flour is an incredible gluten free flour that’s super absorbent and perfect for your baking needs! I’ve made a couple of recipes using it, and I can honestly say it’s one of my favorite baking staples. It’s coconutty, slightly sweet, and high in fiber. DEFINITELY give this stuff a try! Want to know a secret? I use this stuff every.stinkin’.day…for breakfast. I’ll have the recipe up soon, but in the meantime, I have loads of chocolate recipes on the blog that are just waiting for you to try this stuff out. It has such a beautiful richness that I haven’t found in other cocoas that I’ve tried. Lovelovelove this stuff. When I was younger, one of my friends would take “honey shots” whenever she had a sore throat. She swore by its magical “healing powers,” so I decided to give it a try the next time my throat hurt. I don’t know if it actually helped, but daaaaannnngggg was it delicious. 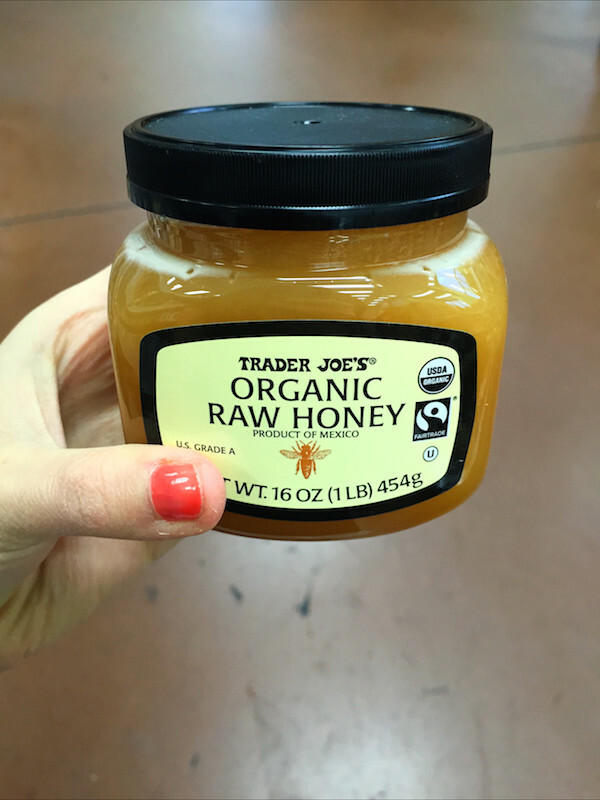 Now, I’m a full-on honey freak. While it’s fantastic in tea, it also makes a fabulous refined sugar alternative in recipes! 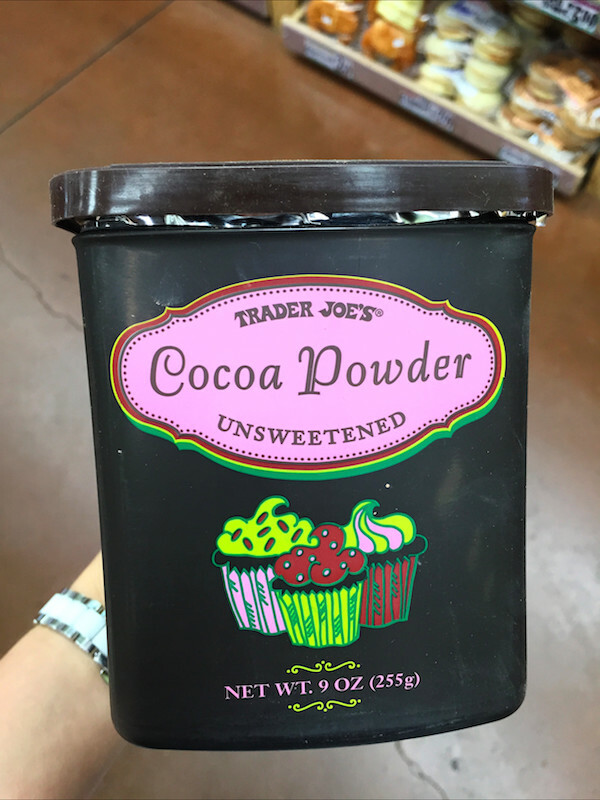 And now you know why I love Trader Joe’s so.dang.much. It seriously is the ultimate grocery store for “foodies,” families, and everyone in between! Did you learn something new about TJ’s? Did I leave out one of your grocery must-haves?! Let me know in the comments! I love following you Alexa! Your TJ’s article is excellent. I also drive over an hour to shop there, and it is well worth the trip High quality, great prices. I will try those items you suggested, although you hit on some of our favs. We also love organic roasted red pepper soup in a box. It is gluten free, but does contain nonfat dry milk. Looking forward to your next post. Say hi to that fabulous Mark! I couldn’t agree more with this list (or this post)! 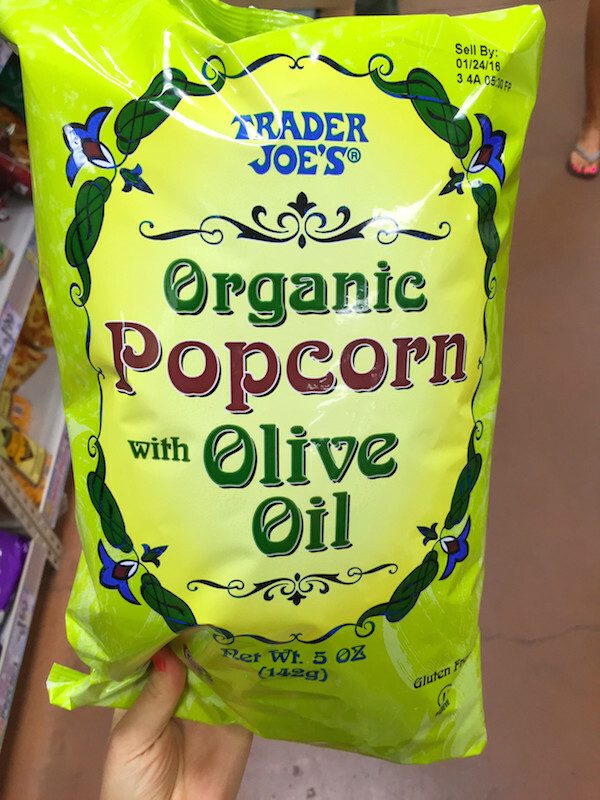 Like you, I love reading posts like this and always find new products I want to try (like that organic olive oil popcorn… yum!). It’s surprising how similar our favorite products are :) NOT! 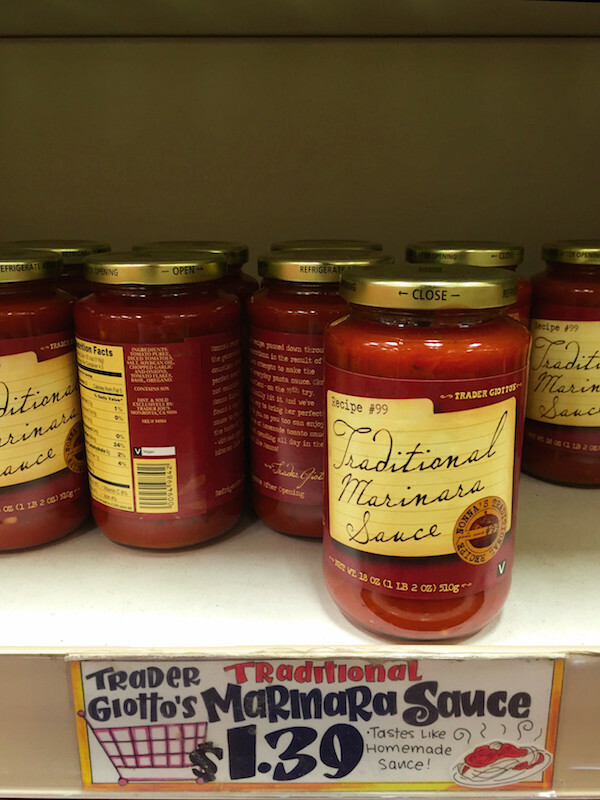 Oh, Mel – Trader Joe’s is a wonderful wonderful store! If you’re ever near one, you owe it to yourself to go! So many great finds! 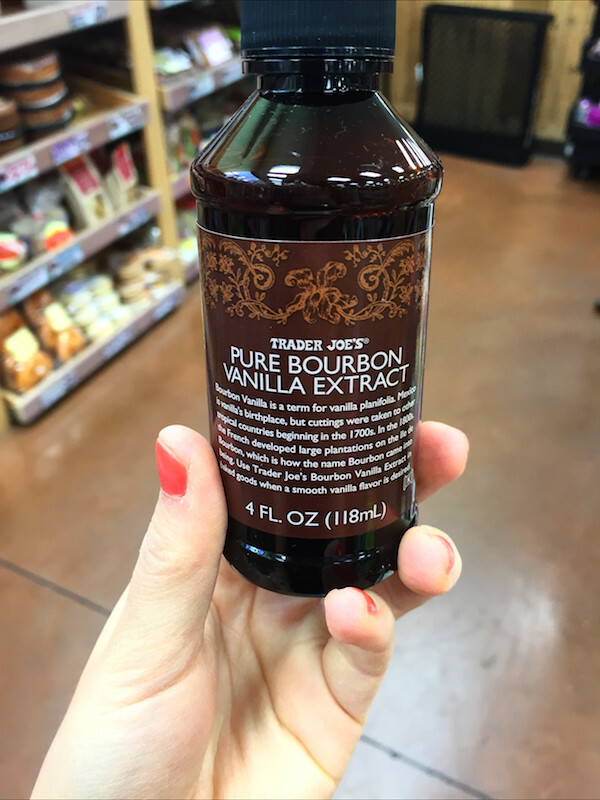 Sorry to burst your boozy bubble, but bourbon vanilla has nothing to do with actual bourbon.